Pakistan shows what an aggressive government policy to get rid of oil can achieve. Pakistan is an oil importer, and as a developing country its fuel import bill is becoming a heavy burden. However, the country is self-sufficient in natural gas. So policy makers dediced the best bet was to replace gasoline cars with compressed natural gas (CNG) cars. Sounds simple. 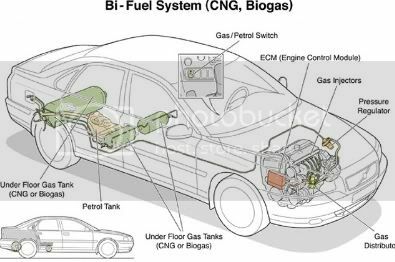 But think of what it means: urging people to turn in their cars voluntarily, creating points where the the fuel system can be converted rapidly and smoothly, installing enough CNG pumps in as many distribution points as possible... It's a monumental task and many were skeptical, with reason. But the results are amazing, though. The Hydrocarbon Development Institute of Pakistan reports that in less than 2 years time the country has replaced 15% of its entire car fleet with the CNG cars (15% of a volume that has been growing very rapidly - making the achievement even more noteworthy). In absolute numbers: it has hit the 1 million mark. Vehicle conversions to CNG are clipping along at the rate of more than 40,000 per month. And the country now has 930 CNG stations operational with another 200 under construction. This makes Pakistan one of three countries in the world with more than one million CNGs in their fleets, behind Brazil with 1,117,885 and Argentina with 1,459,236, according to statistics from the International Association of Natural Gas Vehicles. This example perfectly illustrates the idea that developing countries can "leapfrog" over more developed countries when it comes to using alternatives to petroleum. Since the bulk of the growth in the world's petroleum consumption will come from developing countries, this is a very exciting prospect. Moreover, and this is where things become interesting from our green perspective: CNG cars also work on biogas. Several car manufacturers have already developed so-called "bifuel" compressed gas cars, that use one system to switch between fossil fuel natural gas, and its green counterpart. Now biogas can be produced very easily locally, from a wide range of waste streams (from household waste, to abbatoir, cattle, farming and municipal waste). Thus genuine distributed and locally controlled transport fuel systems become imaginable.